By Louisa Mitchell with John Kingston and Emilie Goodall for Venturesome, the risk financing arm of Charities Aid Foundation (CAF). Published in London in September 2008. A paper aiming to provide clarity on the social investment market in the UK in order to drive its expansion and development. 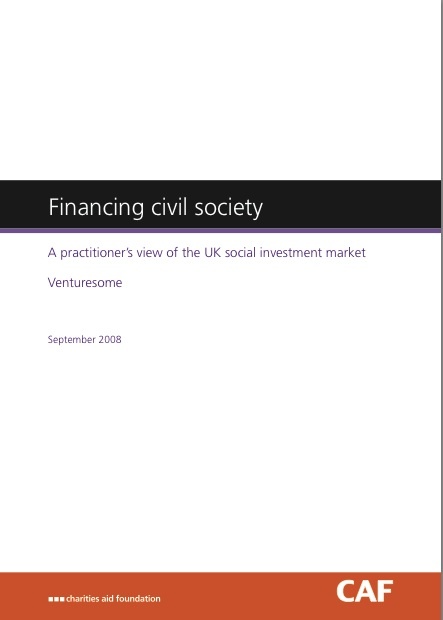 As a practitioner with six years of experience in social investment, Venturesome wanted to offer its perspective on the growing confusion regarding different models of civil society organisations, their social impact and expected financial returns. The paper presents an assessment of the organisational models looking for financing solutions from social investors and on the current state of the supply side of the social investment market. Recommendations are made for how to move the social investment market forward.